Add a bit of spice to your next evening out with F for Fascinating Night from Salvatore Ferragamo. Introduced in 2009, this women's fragrance features a combination of jasmine and rose mixed with mandarin sorbet, pink pepper, patchouli, and white musk to create a scent that is perfect for the woman looking to make an impression. Whether you wear it while you're out with friends or on a date, F for Fascinating Night is sure to make your evening more exciting. 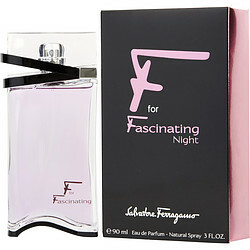 I love the F For Fascinating Night just as I do the original by Salvatore Ferragamo. It has a fresh, clean, captivating smell that last throughout the day. F for Fascinating this was my first try of this fragrance,so i purchased a mini,which is how I try frangrances now,since companies no longer give out frr samples with or without purchase,not like back in the day!i was impressed,perfect to start my day at the workplace,refreshing,and feminine!!!! I love the fragrance, They have the best price I could ever find. Fast shipping Thank you! I thought that the description sounded good so I bought it. I am so happy that I did. I love how it smells!! You will not be disappointed.